probably custom made for you. Wow, the proportions on snakey head are way off. This is of course assuming he is supposed to be shaped like a man instead of a snake. Doctor Wertham, call your office, Doctor Wertham, call your office. 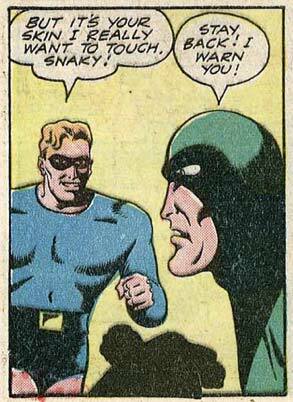 Snaky never wanted to be a villain–he just wanted the inappropriate touching to stop. Sadly, it wasn’t to be.